Rosen Inn at Pointe Orlando is located off of International Drive within walking distance of Pointe Orlando and the Orange County Convention Center. Also within walking distance are a plethora of great restaurant and entertainment options. The hotel features 1,020 spacious rooms in multiple buildings on 26 lush, tropical acres providing families on vacation and professionals visiting on business a comfortable stay in a hotel that’s close to all the major attractions. 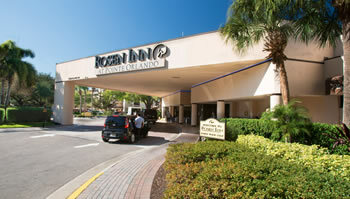 Rosen Inn at Pointe Orlando sets the standard for the Rosen Inn hotel family. Over the years, Rosen Inn at Pointe Orlando has been presented with several awards that solidify our customer’s satisfaction. Rosen Inn at Pointe Orlando offers families visiting Universal Orlando Resort™, Sea World®, and Aquatica® free scheduled shuttles to and from your destination. Reservations must be made in person at the Universal Partner Hotel Vacation Planning Center located in the hotel lobby 24 hour prior to departure. Among all the Orlando vacation hotels, Rosen Inn at Pointe Orlando has proven to be a crowd favorite. AAA awarded Rosen Inn at Pointe Orlando the 3 Diamond rating that recognizes the comfort we provide our guests. On top of affordable prices, we offer special packages to save you even more money during your visit. Make your reservation online or call 800-999-8585. Universal elements and all related indicia TM & © 2019 Universal Studios. © 2010 Universal Orlando. All rights reserved.